Deeway towing offers flatbeds, motorcycle towing, wrecker service, jump-starts, 4×4 recoveries, parking garages, statewide towing, accident response towing and winching. Whether your problem involves the family vehicle or a large fleet of commercial vehicles, you can rely on Deeway towing for quality attention at a reasonable rates, which makes us the best value you’ll find. Deeway towing has very competitive prices compared to industry professionals. 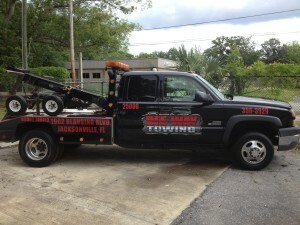 Deeway towing is a company providing courteous and professional 24 hour dispatchers. Our employees are highly skilled, well trained professionals who take pride in their work. Out motto is Quality Service, Integrity, and Customer Satisfaction. Whether you need an emergency tow, a vehicle transport, or temporary storage in a secure lot, we can help provide those services to you. We have a live dispatcher to offer our customers the fastest services in the Jacksonville, Jax Beach, Ponte Vedra, Orange Park, Middleburg, Mandarin, and Yulee. Deeway towing understands towing and will always send the right vehicle for your needs, Out wheel lift wreckers are ideal for areas with low overhead clearance, such as parking garages.